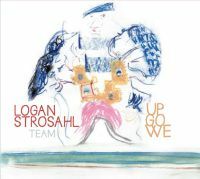 The unconventional structure of the title of Strosahl’s album smacks of post-Elizabethan England. Currents running through the music also evoke that time and place. The composer and saxophonist is a devotee of the orderly composer Henry Purcell (1659-1695) and of disorderly free improvisation. Both elements are apparent. “M.M. Ground,” concerned with post-Coltrane harmonic content, has a wild Strosahl alto saxophone solo leavened with Earl Bostic throat tones. His solo on the album’s only standard, “Smoke Gets in Your Eyes,” establishes his bona fides in the jazz tradition. The composer is a product of the advanced music programs of Seattle’s Roosevelt High School and the New England Conservatory. His septet of young New Yorkers has aspects of bebop ensembles, 1940s jump bands and the most adventurous contemporary classical music and jazz. The ensemble writing is exquisite. Up Go We is 40 minutes long. It rewards hours of listening. I think I enjoyed that bit of prose as much as I enjoyed the music. With a convincing description like that, one can’t help but check out the album. Glad to see a Strosahl has posted a little on YouTube as well, including this live performance.